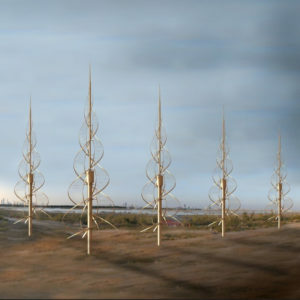 The Land Art Generator initiative (LAGI) was founded in 2008 to engage the world in an exploration of how art in public space can actively contribute to a sustainable future, and how renewable energy infrastructure can become a beautiful extension of human culture. LAGI is co-sponsoring a 2019 competition with a $40,000 first place prize. Dayaway has summarized the competition below in hopes that college students and recent graduates will enter the competition. The full details of the competition appear at this link. 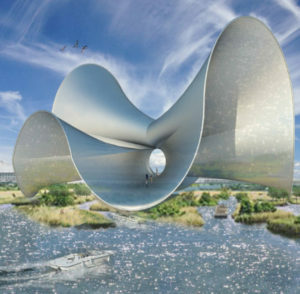 Submit layout boards with artwork depicting three dimensional sculptural forms that inspire the world about the beauty of renewable energy infrastructures (e.g., a building, park, pond, statue, etc.). Your design must be explained in a brief (e.g., renewable energy technology employed, desired cultural impact, etc.). Your design must be build-able, as the winning submission will be built in Masdar City, Abu Dhabi. See the awesome pics below of previous entries (click to study submission details). 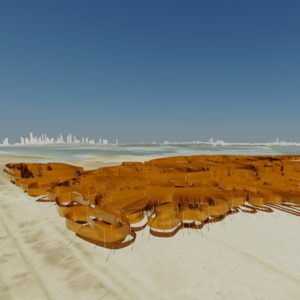 The competition is made possible by the Land Art Generator Initiative, Masdar City and the 24th World Energy Congress. These wonderful organizations are described fully at Next Steps link below. The transition to renewable energy makes us think about grid reliability, consumer cost per kilowatt-hour, energy-storage, and climate change among other things. Foundational considerations to be sure. But we also must recognize the importance of human culture to the renewable energy transition and how art is foundational to culture. LAGI is optimistic that we are witnessing the early stages of a shift from a culture of consumption and exploitation of nature to a culture of sustainability and stewardship of nature. It will be a culture in which art in public space is designed regeneratively to give back to people and to the planet. This is a gift first in visual beauty, experiences of wonderment, education, and storytelling. Second, this it’s a gift of helping to provide—through its own use of renewable energy technology—a part of the energy that will sustain us and make possible our 21st century technical, social, and cultural achievements. While the summary above explains the basics, there’s lots and lots of important details to be read at the following link: LAGI 2019 Abu Dhabi Good luck! !